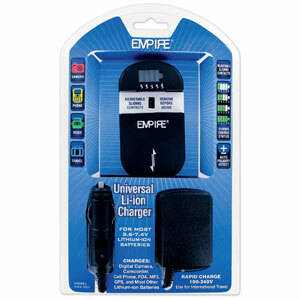 USC-001 : Universal Charger for most 3.6v - 7.4v Li-ION batteries. Charges from Wall outlet or 12VDC vehicle socket. Has adjustable sliding contacts to meet battery contacts. 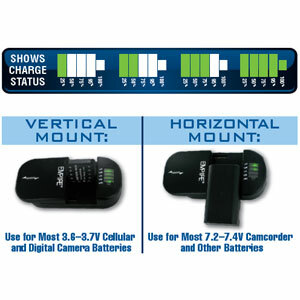 Battery can mount on charger either vertically or horizontally. Spring-loaded cover helps secure battery in place during charging. LED indicators show charging status. Charge rate is approximately 500mA/hour (a 1000mAh battery will fully charge in about 2 hours). Autmoatically shuts off when battery is full. Includes worldwide AC-DC wall power supply AND 12VDC power cord. Size of main charger unit is approx. 4" x 3" x 1".